Since I’ve gotten into USB design using Cypress’ FX2LP chip, I’ve mainly been using command line tools to do control/bulk transfers. That gets old after a while, so I wrote this application. I’m not application developer, nor have any desire to be one. I only write one if it’ll help with some physical device I’m working on. 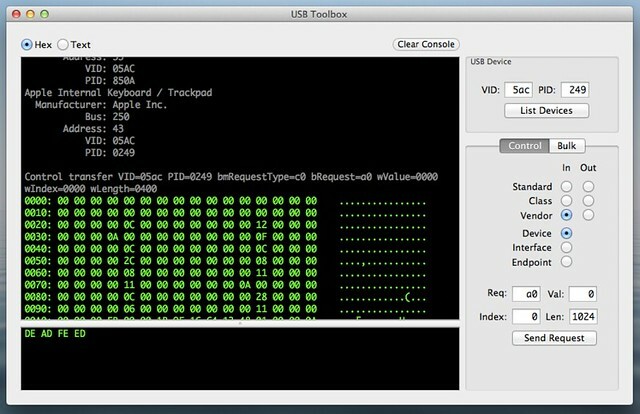 So, USB Toolbox isn’t finished, and probably never will be. I’m only writing a post about it to target the very small audience of people who google some variation of “libusb & Cocoa”. I post more details when add a couple features.